This is a test. Have no doubt, this is a test. You see, you are either in favour of free speech or you aren’t. If so, you don’t get to choose who can speak. That’s sort of the point. Free speech means everyone gets to speak. Even hateful sexist, racist bigots. And when it comes to people with hateful opinions, Bahar Mustafa, Julie Bindel and Germaine Greer are on the A team, without question. And they must be allowed their say. Apart from anything else, if they coudn’t speak, how would we know they were bigots. I’d rather have these people out in the open. You will recall Bahar Mustafa, the Diversity Officer at Goldsmith’s University, London, who, in May this year, posted a Facebook message requesting that men and white people not attend a BME Women and non-binary event. The uninitiated might find it odd that a specified gender or race should be excluded from an event supposedly about “diversity”. The initiated, of course, know that “diversity” means “adherence to approved identity politics”. So excluding white men is to be expected. 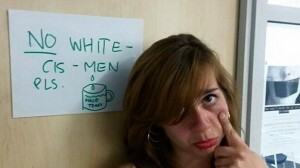 To emphasise her message, Mustafa also posted a photo of herself alongside a notice to that effect – adding a mug of male tears in case we were still in doubt about her allegiances. That Mustafa had also allegedly used the hashtag #KillAllWhiteMen on social media hardly served to mollify those sensitive souls – all 26,900 of them – who failed to appreciate such naked hatred being projected at them. They signed a petition in protest, the thrust of which was that someone holding such views was not really suitable to be a Diversity Officer. I confess I was one of them. In answer to her critics, Mustafa read a statement which was recorded on video. She “explained” that, as a woman and a member of a racial minority, it was impossible for her to be either racist or sexist. It is chilling when someone declares themselves incapable of sin. One knows that one is in the presence of deep moral corruption. All went quiet until, on 6 October, Mustafa received a court summons from the Metropolitan Police to answer two charges, both of which come under the Communications Act 2003. The first is for sending a “letter/communication/article conveying a threatening message”; the second for “sending by public communication network an offensive/ indecent/ obscene/ menacing message/ matter”. You may permit yourself two minutes of belly laughter – even five minutes. Nothing wrong with that. But then you need to get serious about the free speech thing. It’s been a good month for feminists getting a taste of Karma. We have also had Julie Bindel being banned from, of all things, an event titled “From liberation to censorship: Does modern feminism have a problem with free speech?” The gender police in control of Manchester University Students Union banned Bindel for being, as Women’s Officer Jess Lishak put it, a “famous transphobe”. Germaine Greer is guilty of the same sin. She was due to speak at Cardiff University in November in a lecture called Women & Power: The Lessons of the 20th Century. An online petition was launched and succeeded in preventing Greer giving the lecture. The petition claimed that Greer promotes views that are “problematic” for transgender people. The petition was started by Rachael Melhuish, women’s officer at the university’s students’ union. It alleges that Greer has “demonstrated misogynistic views towards trans women, including continually misgendering trans women and denying the existence of transphobic altogether”. Asked about the petition, Greer replied, “I don’t really know what I think of it. It strikes me as a bit of a put-up job really because I am not even going to talk about the issue that they are on about. What they are saying is that because I don’t think surgery will turn a man into a woman I should not be allowed to speak anywhere.” Nevertheless, Greer decided to pull out. Just a quick word about where Greer, and Bindel, are coming from on this trans issue. You see, they hate men so much that they just won’t countenance an escape route for men by “pretending to have become women” (their view, not mine). The young student feminists, exemplified by the NUS Women’s Officers, are sticklers for strict adherence to the current political ruling. Old dinosaurs like Bindel and Greer just aren’t on message. Oh, do allow yourself a good old chuckle. You may make a list of relevant aphorisms, such as “hoist by your own petard”, or, “if you live by the sword, you will die by the sword”, or, “if you sow the wind, you will reap the whirlwind”, etc., etc. But then you must get serious. Those aphorisms should be for the consumption of Bindel and Greer and Mustafa – if they had the wisdom to perceive the message, which, regrettably, is unlikely. But it is the Stepford students who are at fault in the case of Bindel and Greer. We might be tempted, like Richard Dawkins, to tell them to “go home and hug a teddy“. But the issue is more serious than this allows. The crushingly intolerant hive mentally which is taking over our universities is the true enemy here. I stand with Bahar Mustafa, Julie Bindel and Germaine Greer. Now, for God’s sake, pass the sick bucket. This entry was posted in education, feminists and feminism on 26th October 2015 by William Collins. “you are either in favour of free speech or you aren’t” seems like a false dichotomy. Is there any obligation to defend the right to free speech of someone who doesn’t believe in free speech? I doubt Bahar Mustafa, Julie Bindel or Germaine Greer would appreciate such chivalry. To all three I’d say “You’ve made your bed, now die in it”. The only good thing I can think about Feminism it has highlighted misandry and gynocentrism, to awake men and a few woman. Free speech, free speech! Also on a different level when people do hold a negative attitude towards something and they are safe to air it, you can change peoples minds with debate and discussion. Of course all this is on a totally different all level than Feminism. The only good thing you can think about feminism is that it brought attention to how badly men are treated. And this mistreatment of women is what? Unimportant? Non-existent? Appropriate? First let’s help Gregory Elliot, shall we? It’s not a question of “first”. Elliot’s defence should be based on a defence of free speech, and this has to be universal or not at all. So this post should be seen as part of such a defence. You cannot consistently defend Elliot but agree to censoring others whose views you don’t like. To adopt such a line is to accede to a partisan definition of acceptibility. If that line were to be triumphant (as it may well be) then feminism will be the de rigueur opinion which our society will currently impose. I agree, yet it seems many (not you) who are rushing to defend folks like Mustafa, Bindel, and Greer, for some reason haven’t yet had a chance to put out anything in support of Elliot. This is why I figured they must just be rushed off their feet and need help with time management. It seems to me they are rushing to defend Mustafa, Bindel, and Greer because “taking the high road” is the trendy thing to do, not because they actually believe in freedom of speech. EDIT: And in terms of who needs our help the most, well, I’m not aware of Mustafa, Bindel and Greer having their Internet effectively revoked as Elliot has, by government order. Mustafa, Bindel and Greer have fallen foul of a regime they did much to create and those who naïvely support them, presumably with the intention, like those who serve social justice everywhere, of showing just how superior they are, serve only to show how inadequate they are. What should be permissible or acceptable is not what is and those who say or write things that aren’t cannot complain when the fire of intolerance they did so much to ignite and fan consumes them. It isn’t a question of nemesis, karma, schadenfreude or a childish delight in seeing the biter bit; it is simply the case that while we may wish to allow those bigots to say what they will, we can’t because they have denied us that luxury. When we’ve repaired the damage they’ve done, if we can, they can say what they will without fear. Until then they must suffer. You’re talking out of your arse William. Mr Elliot’s defence can only be based on what is lawful and not what you think should be the case. You can disagree as much as you will, you cannot help Mr Elliot by asserting otherwise. Yes, you are right, of course. His actual defence in court has to be based on the law as-is. I was referring to the moral defence. It would be nice if the two things were the same, but they are not – which is, I think, to what you allude. Yes indeed, and my apologies for what now seems a fractious reply and not the light hearted riposte it seemed last night. Believe it or not it wasn’t meant to be.